This fixture had local bragging rights on offer, and lived up to expectations. PJFRFC Marlins were short on numbers, though Chipstead in the spirit of the game, evened teams up, and this ensured a competitive fixture. Marlins shot off the blocks, Chipstead dropped ball under pressure, from the Marlins forwards. A scrum ensued, and Marlins utilized Nick Owen at inside centre, to make 20-30 yards, carving through the Chipstead defence, before releasing full back- Trumper on a switch to score under the post and lead 7-0, within a first few minutes of kick off. Chipstead replied quickly, as their forwards picked up momentum from the kick off, and set up consecutive well supported rucks, with forwards running close lines, and culminating in a try for their centre, 7-7. Marlins were determined to make amends, and did well to keep possession for long periods, though handling errors meant that they were unable to convert this possession into points, much to their frustration. Marlins utilized their centers Nick Owen and Ben Tompkins well, to penetrate the opposition gain line, and Chipstead did well to defend through cover tackles. 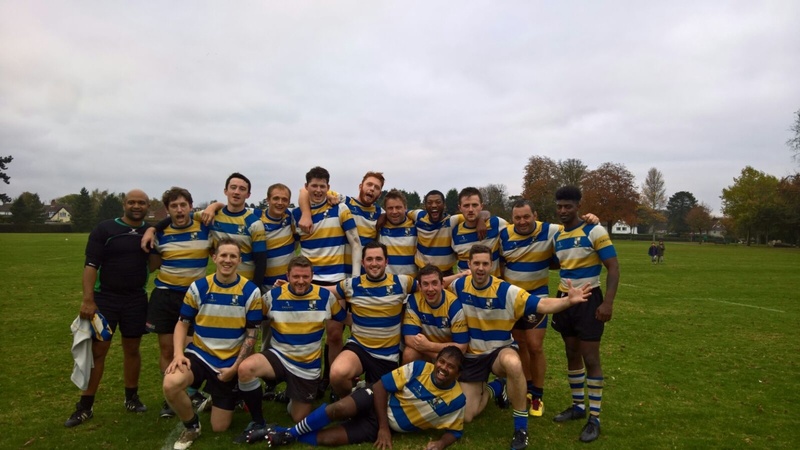 Marlins were camped in the Chipstead half for a period of time, and Mawer competed well at rucks, without any complements from the referee, ably assisted by captain Dan Wright and young Fisher school leaver Kian MacNulty. Will Walters marshalled his forwards well, helping link forwards and backs from break downs. Chipstead scored against the run of play, as ball spun out wide, fell to ground and the ensuing counter attack led to a try, Chipstead led 12-7, though with Marlins enjoying long spells of possession, and with both centers running good lines of run, PJFRFC worked the ball back in from Del Boy, on the wing, for Will Walters to score and equalize 12-12. Jules replaced Del on the wing, as Del was suffering from a gammy shoulder. Jules saw action from kick off, as he gathered a funny re-start to the backs, and off loaded to Kian MacNulty, who ran 20 yards, before off loading to Simao, to score under the posts, and lead 19-12. Chipstead were determined to finish the half on a high, and threw themselves into the game. This concerted attack was defended well, with Trumper making a try saving tackle, at 22 yards, though Chipstead kept up the pressure, and utilized their big forwards to lull their way towards the PJFRFC line, a determined defensive display by Norm Collier, and his backs, who put in a shift akin to the colliery, thwarted several efforts, though, eventually the Chipstead backs worked the ball wide to score and finish the half 19-19. Chipstead made fresh substitutions, and swapped loaned players PJFRFC Marlins, who took time to find their rhythm again. This along with some crucial handling errors, cost them dearly. Chipstead pounced on spilled ball, as PJFRFC backs did their best to utilize the breadth of the pitch. Fly Half Norm Collier’s distribution, kept Chipstead on their toes, and almost as unpredictable as (Coulsdon) Cipriani. The ball was worked down the line, and Ben Tompkins, did well to off load to Jules, who made a few yards, before off loading to Andy MacHugh, who was unlucky to score, 2 meters from the Chipstead line. This was a recurring theme in the second half, as PJFRFC Marlins made a few unforced errors, at crucial moments in the game, foregoing scoring opportunities. In turn, gifting the opposition with counter attacks, and two consecutive tries, and lead 31-19. Marlins did well to continue to compete at breakdowns, and Rowing Mawer was rewarded with ball deep in opposition half, and a fisher flair moment ensued, with Norm distributing ball out wide, through Nick Owen, to Ben Tompkins, who selflessly passed out wide for James to score and restore some pride, 31-26. Chipstead made a concerted effort to put pressure on the back line, and this led to errors, which again led to two further scores to Chipstead, and finish 41-26, though Marlins would feel a little hard done by. Andy MacHugh, and the rest of the old guard, would be pleased with their performance, and were desperately unlucky, though would be happy to have collected a couple of points, also having enjoyed a game of open rugby. Marlins travel to Sutton and Epsom, to play their thirds next week.